The Camera Mapper plugin allows you to simulate a 3D scene from 2D footage. It enables you to isolate one or several objects in your footage, project these objects on a separate layer and pull that layer out of the background, creating the visual illusion of the object floating in front of the original footage. Camera mapping is a key part of compositing applications such as Nuke, and while you could do this natively in After Effects, it would be only at the expense of some complicated work arounds that cost time and lack important capabilities. A background scene you want to convert to 3D. This typically is a still image or a locked off/stabilized shot. Two Cameras - a render camera to render and move around in the 3D scene and a projection camera that looks directly at your scene. One or more After Effects Solid Layer(s). Projection Camera: The Camera used to line up the original image or footage with the Solid Layers that act as a projection screen. Projection Layer: The Layer being projected. Once you’ve applied the Camera Mapper effect, the 3D solid will seem to disappear, but when panning around with the active camera, you will see the solid having taken over what’s behind it. Alpha Handling: The way masks on the projection layer will be handled. You can use the alpha layers of the original footage to reveal exactly what you want to project (normal), or use masks in After Effects. You can have dozens of solids in a scene, so label them with meaningful names. Each solid should be positioned in front of the scene component that you want to call to the front. If you’re working with objects that demand accurate positioning, create your solids to measured sizes and locations. For example, if you’re going to project a porch of a house, you should either create a solid that has the exact size of the porch in the footage and parts that need not be called out should be masked. If part of the scene is perpendicular to the cam- era, like a sloping rooftop, there is nothing to map onto the solid. In that case, you’ll have to fake it. You can do so by opening the original image in an image editor like Photoshop, copy the part of the scene that is perpendicular to the camera and drop it into the composition, aligned with the area that you want to appear as 3D. The Camera Mapper plug-in’s results depend on After Effects’ model of the world. After Effects does not know real 3D. Instead, it uses projec- tion planes that it positions one on top of the other (or one in front of the other) so that you get a result that looks like 3D but really isn’t. This restricts you in what you can do with the Camera Mapper plug-in. You won’t be capable of modeling objects with round edges. You can also not use curbed surfaces, because you can’t bend objects in 3D space. And of course, you can’t move the camera 360 degrees around the objects, because we don’t have any data of the back of the objects. Imagine you want to break out an object from its background. These are the basics steps. 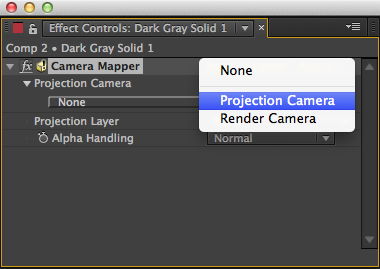 Create a Render and a Projection Camera from the Layers > Camera menu. Make sure both cameras have the same settings. Create one or more solid layers from the Layers > Solid menu. Turn the original footage and the Solid layers into 3D layers by clicking the 3D layer icon in the Timeline or selecting 3D Layer from the Layers menu. Select the first solid layer you want to use for the Camera Mapper effect. 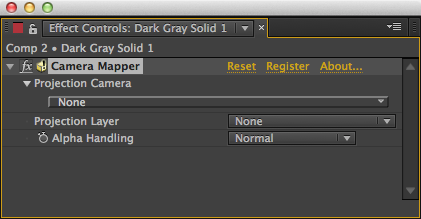 Select Camera Mapper from the Effects menu. From the Projection Camera drop-down menu in the Effects panel, select the camera you designated as projection camera in step 2. From the Projection Layer drop-down menu in the Effects panel, select the original footage you want to use as projection map. Adjust the solid so it stands separate from the original footage layer and move the active camera around to see the effect. Select the Alpha Channel you want to use. Freely animate the Render Camera to create a new 3D animation.